As I have said before, if you were to look at my eating habits at this point ‘on paper’, you wouldn’t take a second glance. If you saw me on the street, there wouldn’t be an ‘OMG get him a cheeseburger STAT!’ reaction. If you compared my workouts and my food intake, you would not think they were out of whack. According to my doctors I am at a healthy weight and all of my blood levels are solid. Yet if you could look inside my head, you would know that I struggle. I struggle with eating because I don’t want to become fat again. That fear is a major driving force in my life; for a long time I stayed right around 200lbs, but after getting all the way back to 275 after my thyroid died, I am now concerned about maintaining my fitness and weight loss. That doesn’t always lead to the best behavior or choices – but I like to think that awareness also prevents me from going too far in the other direction. That is why I say I have ‘disordered thinking’ – I have never been diagnosed, am neither binging nor restricting, but I will always have a ‘complicated’ relationship with food. My initial intent was to write about handling this relationship on a daily basis, but in the last few days I have come across a few great posts that have inspired me. Someone on Twitter linked to a post called You Get to Choose Your Story, and the next day Danielle posted about rewriting her post-divorce story. Then Cori posted a great image in a post called ‘insecurities’ (since the image IS the post, I won’t put it here … worth a visit for sure) that had me thinking about how my own body image issues impact those around me. And finally as I was finishing this post up this morning there was an inspiring post at Snack Therapy called ‘You’re Allowed to Love Your Body’. Yes, yes you are. Story #1: I will always be the fat kid – I was obese until 23, got really heavy again by 45, and am one bad choice away from heading right down that path again. Story #2: I have left behind my obese childhood, and lost my post-thyroid weight and have a plan. I am in the best shape of my life, and lighter than I have been since before I stopped growing (i.e. before entering high school). I have learned so much about eating, fueling, running and myself that even through my life will likely have hills and valleys in the future, I have left behind the disordered approach to weight loss and maintenance through extreme restriction and replaced it with healthy choices and proper fueling. My choice? I choose Story #2, and am going to OWN that story. It seems obvious – but it is not easy. It is easier to point to our shortcomings than to our victories, easier to look at how we might fail rather than how we are succeeding. But it is REALLY important to choose the story that empowers you rather than drains you; gives you inspiration to move forward rather than a fear of falling back. By choosing our story we enable ourselves to develop a clearer vision of where we are going and where we want to be headed. So I choose to look at where I am now in life and be happy – happy that I have learned, that I am healthy, happy and loved and supported, and that I am in a position to stay in good health enjoying my favorite hobby for the forseeable future while enjoying the foods I love! How are YOU Choosing Your Story? This entry was posted in Eating Disorders, Happiness, Healthy Eating, Life Balance and tagged disordered eating, Eating Disorders, Healthy Eating, weight loss by txa1265. Bookmark the permalink. There are always 2 ways to look at your life, emphasizing flaws or strengths, and although I have bad moments I know now it does me no good to put my flaws under a magnifying glass! Story 2 is the truth, story 1 is an expression of fear. Well, not sure I completely agree Michele – BOTH stories are ‘truth’ to an extent, but #1 is viewed through the filter of fear and #2 through the filter of confidence. Know what I mean? This gives me something to think about. I’ve never thought about rewriting my eating disorder story and I’m not even sure I could at the moment. I’ll definitely be working on it, though! Thanks for making me think this morning! Thanks Danielle – and thank YOU for making me think as well! I don’t have a ‘relationship story’ with people like yours, but I DO have one with food 🙂 And I think it would be interesting if you DID get to the point to look at your ED story in this way … which remains some of the best stuff I have ever seen on a blog. My story is a parallel to yours. Right now I am at that healthy point, the beginning of story #2. I fear that a single weekend food bender could pave the way back to story #1. I fear that my fitness habits right now are a hobby rather than a lifestyle, hobbies have come and gone throughout life. It will take time and conscious effort, but I can see myself turning the corner where the fear of story #1 is replaced with a more permanent story #2. Long term goals will help, like running another marathon in fall of 2015. Writing my story #2 alongside my wife who is also writing her own, together we can let go of the fear. A desire to show my daughter that it is better to live with joy and hope rather than fear will help too. Thanks, and I absolutely agree that there are no negatives and all positives to ‘rewriting your story’ … but that doesn’t make it any easier. The ‘fitness as lifestyle’ is definitely one I get at this point, along with eating better it has become a cornerstone that allows me more positive thoughts! Thanks – good luck finding your own story. I’m glad you had the courage to share you story with the general public as many people can relate. I myself do not have an eating disorder, but I think that rewriting your story can pertain to anyone going through any rough patch in life or disorder or disease. Thanks for sharing! Thanks – I agree that it can pertain to just about anything! Fabulous, as always. And something that I so completely relate to. I, too, will always have the chunkster mindset from my childhood, will always have the fear of getting big in a not healthy way again. But I wanted to rewrite my future, and give myself the chance of a family, and so I had to redirect my path. And I constantly have to monitor and recalibrate, but what is important is knowing that I am in charge of my past, present, and future, or at least the way that I perceive them and the outcomes. Thanks Suz – and you are so right! You have had loads of struggles to get through, but we always have a choice of who owns our lives: us or our struggles. I know it isn’t easy, but am confident you will keep doing great owning your story! I am THRILLED you chose option 2!!! OWN IT! I wish more people struggling would choose to OWN their story too! Thanks so much! I think the sentiment you expressed – there is no ideal – is so important. We are all just seeking the best version of ourselves. I love this, and i feel like a lot of people can relate. I can so relate to this. With eating, but also with running. I want to run faster, and have been outspoken about my desire to do this. My Story #1: Implement speed work into my training, tweak my diet, and be rigorous in my pursuit. My Story #2: Just run faster, whatever that takes. I know this might sound silly, but I finally had the epiphany that in order to run faster, I just had to make my mind up that I was going to do it, instead of overanalyzing, like I was in Story #1. Story #1 will make you hate something that you are supposed to (and always have) love(d). Or at least that is what it did to me. I still do that hard training, clean eating, and narrow focus. But because of my approach and my knowledge that I just need to make my legs GO, I am much happier. Great comment – as I am reading in ‘Diet Cults’, there is a section that looks at weight loss success, and the one real common element is not some ‘name brand’ diet or common foods or type of exercise … but the willingness to do whatever it takes to lose weight and keep it off. That is exactly what I thought as I read your ‘run faster’ plan. Interesting timing as I was about to share my story regarding the difficult relationship I HAD with food for so many years. Part of me is scared to share it. Part of me feels it’s a story that must be shared. I appreciate you sharing yours and giving me yet another perspective. 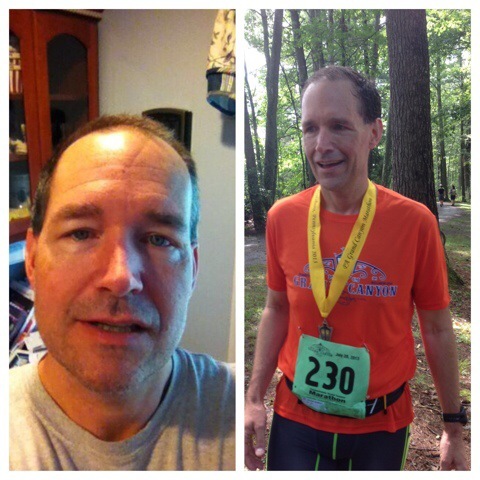 I hope you got to check out my ‘weight loss journey’ posts (https://txa1265.wordpress.com/2014/05/30/part-two-of-my-weight-loss-and-running-journey-at-the-gluten-free-treadmill/) – I go into a lot more detail there. Because if you read that you can guess my thoughts – if you think you do, then you DO have a story that you should share. I would love to read it. Going from peak marathon training to a screeching halt really highlighted my disordered relationship with food over the past 5 weeks. I am also “one bad choice away from heading right down that path again.” I have struggled with binge eating for many years and though it has improved greatly, it does happen occasionally. I have developed coping mechanisms to move on more easily from a binge rather than let it spiral out of control. Despite being much less active right now I am successfully maintaining my weight. So glad you are maintaining … that has to be a very difficult struggle for you! Knowing about your injury and the issues of food on top of it … that has to be rough. Kudos for keeping on top of it! As someone who has left behind obesity and an eating disorder, this hits close to home. You’re completely right, how we look at past events is up to us. We can look at it as a victory or as a struggle and how we choose to cope with it really paints the future. Thanks for sharing Katie – I enjoyed reading your story, and how you continue to worry about weight – it really is a struggle and not easy to leave behind.